Great shots of Lee Harvey Oswald in New Orleans in 1963, distributing leaflets for Fair Play for Cuba. Excellent MSs LEE HARVEY OSWALD and Hispanic man handing out Fair Play for Cuba leaflets ("Hands off Cuba") on street corner in front of International Trade Mart across from Arden's Bar in New Orleans, August 16, 1963. Cut to MSs several slick-looking men-- CARLOS BRINGUIER and fellow Cuban exiles-- wearing sunglasses & business suits, descending stairs, entering courthouse for sentencing on Aug 12, 1963 (Bringuier & cronies attacked LHO for distributing pro-Castro flyers on Aug 9); MS Lee Harvey Oswald leaning against wall in lobby with arms folded, looking surly, pan left to Cuban exiles milling about; CU tattered, dog-eared copy of "Guidebook for Marines" being held by one of the Cubans; MS LHO in same position, looking briefly at cam; MS LHO exiting courthouse. Cut back to Aug 16, 1963: TLS International Trade Mart; MSs Oswald and two colleagues (one of them Charles Steele Jr.) distributing flyers outside Trade Mart-- this is the footage that conspiracy theorists allege that a figure in the BG is Clay Shaw (it's not) & two FG figures are Charles Rogers & Chauncey Holt. This segment is collectively known among JFK assassination buffs as the Johann Rush films. Kinescope footage of Dallas city jail basement garage just before the murder of Lee Harvey Oswald. Extremely long continuous take showing Dallas police officers & detectives preparing the van that will transport Oswald to county jail. Kinescope footage of Dallas city jail basement garage just before the murder of Lee Harvey Oswald. Pan right to see television cameraman pushing large bulky video camera on tripod through crowd of reporters and police as they wait for the Oswald to emerge. Long continuous take showing men standing in line forming a corridor in the basement garage as they wait for LHO to pass through, an unidenified car passes by. Kinescope footage of the Dallas city jail basement garage just before the murder of Lee Harvey Oswald. 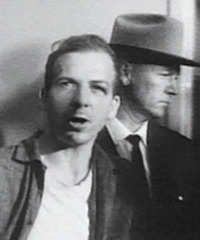 Shot begins with a long continuous take of reporters & police detectives forming corridor, waiting for the suspect to emerge, getting in positions for Oswald to appear, a car is heard honking off-screen, slight pan LT as officer JIM LEAVELLE enters frame handcuffed to LEE HARVEY OSWALD, the car honks again from off screen and then a third time as it pulls into view just as JACK RUBY plainly jumps out of crowd in front of camera and shoots Oswald, slight pan RT as officers tussle with Ruby, video keeps rolling to show confusion and aftermath, photographers snapping pictures, detectives & uniformed police officers regain order of the scene. Slightly angled GV main entrance into the police headquarters builing with reporters and photographers present. Back to the Dallas city jail basement garage with uniformed police and plain clothed dectives setting up crowd control barrier. MS/CUs grave and grave marker of Lee Harvey Oswald at Rose Hill Memorial Park in Ft. Worth, Texas. Brief MS Kennedy conspiracy author MICHAEL EDDOWES (Michael H. B. Eddowes) speaking to off-screen reporter about exhuming Oswald's body in order to disprove his (ultimately crackpot) body switching theory-- the body of LHO was swapped with that of a look-alike Soviet agent. JFK assassination conspiracy hoopla. Lee Harvey Oswald being interviewed at WDSU-TV studio in New Orleans, Aug 21, 1963 Interview of LEE HARVEY OSWALD (bad audio, but can be fixed in mastering) in the WDSU-TV studio in New Orleans, Aug 21, 1963. Lee Harvey Oswald says he is not a communist, that he has studied Marxism and sympathizes with the philosophy, eventually admitting that he is a Marxist. LHO explains the difference between Marxism and Communism. LHO begins to discuss the work of the Fair Play for Cuba organization before the film cuts out. This is oft referred to as the Mike Lala Film. Jack Ruby shoots Lee Harvey Oswald - Footage of the murder of Lee Harvey Oswald, good angle to see Oswald's face durning transfer and shooting. MS officer JIM LEAVELLE leading LEE HARVEY OSWALD into basement garage from the Dallas city jail (police headquaters), JACK RUBY is seen leaping out from screen right and shooting Oswald in the stomach, Oswald drops and the camera is jostled about in the ensuing chaos.Interesting to note that Oswald quickly turns his head to Ruby a second before Ruby moves. Jack Ruby shoots Lee Harvey Oswald - Footage of the murder of Lee Harvey Oswald, good angle to see Oswald during transfer and shooting. Kinescope footage of the Dallas city jail basement garage for the transfer of Lee Harvey Oswald (police headquarters): Famous head-on shot of Officer Leavelle handcuffed to Oswald, leading him into garage, Jack Ruby coming out of nowhere and shooting Oswald. CU Ruby being wrestled to the ground. Jack Ruby shoots Lee Harvey Oswald - Footage of the murder of Lee Harvey Oswald, good angle to see Oswald durning transfer and shooting. MCU elevator doors, light panel of right showing car going up. Great wide MS Dallas police detectives getting out of elevator, officers JIM LEAVELLE and L.C. GRAVES escorting LEE HARVEY OSWALD from elevator. From behind shot of Leavelle & Graves walking Oswald into garage, Jack Ruby leaping from crowd and shooting Oswald-- here you can see that Oswald looks at Ruby, then looks away before Ruby jumps out to kill. Chaos as Ruby is escorted into the police station. TLS/MSs detectives & officers in basement office; pan left as Jack Ruby is hustled into the elevator by police. More shots hectic post-shooting scene in basement garage. MS bloodstains of LHO on floor of office. 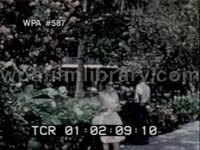 DO NOT USE James Doyle Home Movies - Lee Harvey Oswald: This home movie was shot in New Orleans while Lee Harvey Oswald was living there, at the time known know to hand out pro-Castro leaflets for the Fair Play for Cuba Committee. This could very well be the scuffle he had with Carlos Bringuier on Canal St. GV street scene showing Lee Harvey Oswald facing away from camera having words with a man in sun glasses, he then talks to a police officer and points at the ground as if explaining his side of the story, a large number of people have gathered to witness the commotion in front of "Stevens" department store. View of Oswald seen through the crowd, good closer shot of his face as he begins to walk away, streetcar seen in BG. LS street as people begin to disperse, police are still on the scene.